Midshire is proud to be the only UK based partner of DataOn, a leading provider of powerful, high-performance storage solutions and disaster recovery. DataOn partners with some of the world’s leading information technology brands including: Microsoft, Nexenta, CloudByte, LSI Corporation, SanDisk and Intel to name a few. 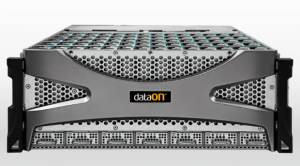 DataON transforms the traditional computer and legacy storage subsystem into a scalable, resilient converged platform tuned for Microsoft software-defined storage. The resulting platform architecture provides customers with the confidence in their storage infrastructure design to solve today’s storage challenges whilst aligning to tomorrow’s growth requirements of on premise, private and hybrid cloud deployments on the Microsoft platform. Their innovative Cluster-in-a-Box (CiB) product is transforming server environments across the globe. This industry leading solution is both cheaper and easier to deploy than traditional servers. By leveraging the unused capacity, virtualization efforts can dramatically reduce capital purchases of new server hardware. There are 60 – 70% savings over a traditional SAN (Storage Area Network e.g Dell EMC, Netapp) comparing costs with similar solutions from netapp and emc. One of the many challenges in IT application deployment is rolling out new servers. With virtualization, you can provision a server in hours or days, not weeks. This gives you greater managerial flexibility and options. What are the advantages DataON? 1. Reduced hardware footprint – By consolidating your servers into a virtual environment there will be a reduction in operating expenses. With fewer servers to operate, you can achieve far lower costs for power consumption, cooling, real estate and maintenance. 2. Cluster-in-a-Box enables resiliency, failover capability – The Cluster-in-a-Box is an innovative platform engineered from the ground up to scale highly-available computer and shared storage services in a hugely efficient and energy saving, condensed footprint. Certified for Microsoft Windows 2016R2, the CiB was developed as a hyper-converged infrastructure (HCI) appliance to streamline acquisition, deployment, and easily scale with simplified support management. A Microsoft hyper-converged infrastructure creates single source efficiencies between the virtualization and storage layers. Designed specifically for Windows Server storage tiering and clustering features, DataON hyper-converged CiB appliance scales compute and storage incrementally, with high-performance and high-availability while reducing complexity, interoperability issues and capital expenses. 3. Easy to administer using an all Microsoft solution. – Server 2012 r2 certified products utilise Hyper-V and storage space technology to deliver cost-effective, highly available, scalable, and flexible storage solutions for business-critical (virtual or physical) deployments. Storage spaces are sophisticated storage virtualization capabilities, which empower customers to use industry-standard storage for single computer and scalable multi-node deployments. It is appropriate for a wide range of customers, including enterprise and cloud hosting companies, which use Windows Server for highly available storage that can cost-effectively grow with demand. 4. Jbod (Just a bunch of Disks) Enclosure – DataON Microsoft Windows 2016R2 Storage Spaces certified JBOD Enclosure can be deployed into greenfield or existing highly-available scale-out clusters. JBODs were previously known as DNS 1640. Optimised with storage tiering of solid state drives SSDs and hard disk drives HDDs and fast re-build features, DataON storage platform with 12G SAS networking technology delivers million input / output operations per second (IOPS) performance with the best cost per GB value. 5. Backup storage – Leveraging the power of Microsoft Windows 2012R2 technology and the extensive technical expertise of the DataON products, customers can design, deploy, scale, and distribute dense backup storage in a manner that is the most efficient, reliable and cost effective. Backup Storage design is best when started small and then scaled non-disruptively by adding Microsoft certified highly dense storage servers and/or DataON massively dense JBOD enclosures as building blocks. This ready to deploy Microsoft DPM backup storage solution, bring high availability and reliability with no single point of failure to reduce the number of disparate components and provides world leading energy and density efficiency.